There are two ways to respond to the above line. First is with a tuneful burst of “dum de diddly, dum de diddly, dum de diddly dum” and the second is to wonder what the heck I’m on about. If you’re in the former group then there’s a good chance that you are a regular listener to the UK’s longest running radio drama – The Archers. If you’re in the latter, well this is all going to be a bit baffling for you. I wasn’t brought up with this tale of simple country folk so I was not indoctrinated by my parents or grandparents (the latter of whom were definitely ‘simple country folk’ and my Grandad had more than a passing similarity to Joe Grundy). I discovered it all on my own – well via a slightly snooty boyfriend. He moved on eventually but left me with the legacy of what now amounts to over 20 years of listening to the Archers. I infected my poor husband as well as my parents and my sister. In our family you can ‘talk Ambridge’ without fear that nobody knows what you are on about. I’m not an addict – I think it’s important to say that. No really – I know addicts always SAY they aren’t addicts but I can go a week without listening and then catch up on the weekend. If I have to do so, I can go longer. I have it under control, you see. I don’t rely on the BBC i-player if I miss a few days. I can control it – the Archers don’t control me. However I do count a good day as one where I get to listen to the Archers on the way home from work and a bad day as one where I’m still at my desk at 7 o’clock missing the show. 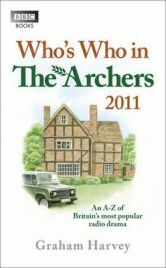 I’ve never bought an Archers product before but ‘Who’s Who in the Archers 2011′ was an impulse buy bought about by trying to hit the minimum order value for free postage on a website. I thought I was already pretty good at knowing who was who by their voices and at remembering how they were all interrelated but even so I still learned quite a lot from this little book. As a relatively recent listener (20 years is nothing in the grand scheme of a show that’s run for over 60) I wasn’t familiar with the ‘olden days’ but I’d never found that to be a problem. However, Who’s Who helped fill in some of the gaps in my knowledge. There are times when you get a niggling question in your mind about the show. In my case I was recently trying to remember whether Lilian and Matt were actually married (they’re not) and whether Debbie and Adam were full brother and sister or half-brother and sister (they’re halves). I couldn’t remember how old some of the kids were supposed to be so the book helped with that too. It’s odd but all the under 20s have been born since I’ve been listening and you do start to feel like they’re part of your extended family. There’s no point asking my husband what’s going on – he doesn’t recognise the voices and can never remember who’s married to whom. I didn’t expect to learn much from the book but I was surprised. I had always been confused about Jennifer’s children and I thought that Kate and Debbie were full sisters – WRONG! I knew that some of the characters never speak – Sabrina Thwaite for example – but I hadn’t realised just how many of the characters who’ve been there for many years don’t actually ‘exist’ in terms of every saying anything. Who’d have thought that Bert Fry’s wife Freda has been beavering away in the kitchens at The Bull without ever saying a word, along with ‘Rhys the Barman’. And the Titcombes have been doing sterling service at Lower Loxley for many years without so much as a word. In a small hardback of just 128 pages you can get the low down on not only who’s who but also what’s where with the local villages, towns and city all featured. Key businesses and farms are also profiled and there’s a very handy family tree to keep you on the button with the interrelationships of the Archer family going right back to the 19th Century. Each character with a speaking part gets a short profile, most of them with any previous names (which for some of the women can be complicated) where they live and usually when they were born. The names of the actors who play the parts are also given. There’s a short synopsis of key plots that the characters have been involved in during the past year and what look like small hints about where a few of them might be heading. I wouldn’t buy this every year but I was surprised to find quite a lot of things I didn’t know about. Is my life richer for knowing them now? Probably not but I found it quite an entertaining little read. I polished it off in a couple of hours. I think it’s better suited to relatively recent recruits to the 5 million strong band of listeners who may not yet be completely familiar with how everything and everyone fits together. I wouldn’t buy it every year for myself but if a friend had recently taken up the show, I’d find it a potential gift to offer them. As a stocking filler for the Archers listener I’d suggest not to give it every year but once every few years it might be a welcome gift. One Comment on "Who’s Who in The Archers 2011"
I’ve never listened to the Archers, but I would have sung the next line back to you, thanks to Billy Connolly. The Big Yin once suggested that the Archers theme should be the British national anthem because God Save The Queen is so slow that we get overtaken at the Olympics opening ceremony as our lot trudge along to it.